Alaska Gov. Sean Parnell is scheduled to sign Senate Bill 159 today to allow Airlift Northwest to reinstate its AirCare program for the state's residents. The annual-subscription program covers deductibles and coinsurance fees for emergency air medical transport that might not be covered by insurance, guaranteeing members no out-of-pocket charges. 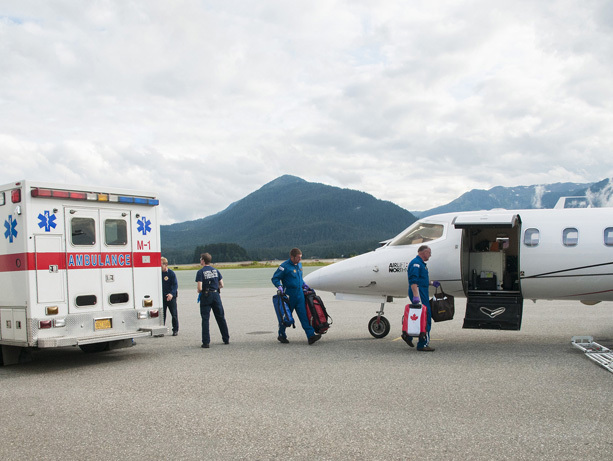 AirCare was suspended in Alaska last November when state regulations governing nonprofits were interpreted to preclude Airlift Northwest and other air medical providers from offering what was deemed an insurance product. Airlift Northwest, the Alaska Division of Insurance, Alaska legislators, and individuals from the state and elsewhere worked together to bring AirCare back, which resulted in a bill clearing the Senate in February. An Airlift Northwest flight nurse reads a patient’s EKG strip in a turboprop in Juneau. An Airlift Northwest flight nurse reads a patient’s EKG strip in a turboprop in Juneau, AK. AirCare membership costs $99 per year in Alaska and pays the remainder of the cost of emergency medical transport not covered by insurance. One membership covers an individual and everyone in his/her household. Airlift Northwest first offered AirCare in Alaska in 2008. More than 3,200 people have signed up for the service, most of them in Southeast Alaska. AirCare is also available for Washington state residents. For people vacationing in Alaska or Washington but who are not residents of these states, Airlift also offers an AirCare package good for three consecutive months, at a reduced rate. Airlift's flight crews comprise two critical care nurses trained in advanced cardiac, trauma and pediatric life support. This level of expertise is unique in the air medical industry and comparable to that found in a hospital intensive care unit. Visit the AirCare enrollment page.